Wednesday August 22, 2018 - Luhya leaders have been asked to wind up their political parties and form one outfit to bring on board the region’s entire political players. Speaking in Nairobi yesterday, Kakamega Governor Wycliffe Oparanya said Luhyas would not benefit until all the parties in the region unite to advance a common cause for the people. 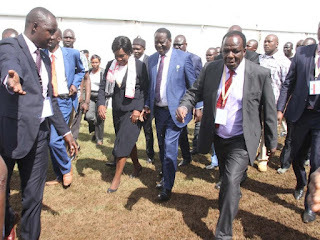 Oparanya, who is also the Deputy Party Leader of the Orange Democratic Movement (ODM), said he was willing to quit the party and join other Luhya leaders to form one political party. He warned that the Luhya unity will remain a pipe dream if all leaders from the region do not put aside their personal differences and form one formidable political vehicle. “We cannot achieve this when each of us has a small party that he uses for selfish gains,” Oparanya said. “A brother does not need months to consult to enter into another’s home,” he said.